Prepare light or medium syrup. I prefer light syrup. Simply heat water and sugar in a sauce pan until sugar is dissolved. Peel your peaches. Do this by dipping peaches in boiling water for 30 seconds to 1 minute. 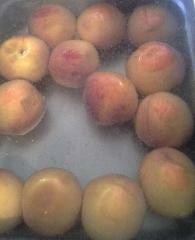 Immediately remove the peaches to a sink or bowl with cold water to stop the cooking. Slice the peaches in half and throw away the pit. You'll notice a 'seam' down one side of your peach. 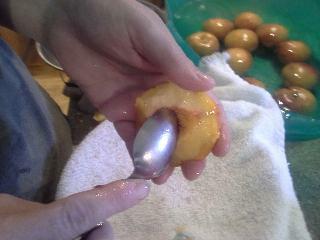 If you slice around the diameter of the peach following this line you will be able to pluck the pit right out. To prevent browning of peaches until you are ready to put in jars, using Ball Fruit-Fresh Produce Protector according to instructions on package. Start by preparing jars, and get water in your canner heating. Prepare light or medium syrup. 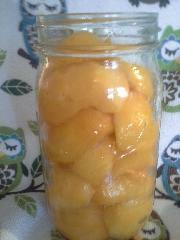 I prefer a light syrup for canning peaches. Simply heat water and syrup in a pot until sugar dissolves. I like to do this right in a tea pot. Pack peach halves with cavity side down. They pack better and you will fit more in a jar. 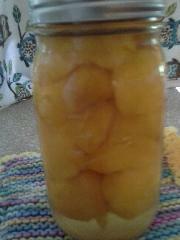 If you have wide mouth jars it makes it easier to place the peaches in the bottom of the jar cavity side down. When canning peaches you can either raw or hot pack. It is up to you. Raw pack~ I prefer to raw pack, you can raw pack and fill one jar at a time as you peel, pit and slice, then immediately cover the peaches with hot syrup and place in hot water in canner to keep warm while I prepare the next jar. Or place them in a bowl with Ball Fruit-Fresh solution. This prevents peaches from browning. 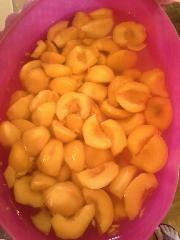 To Hot pack ~ slice peaches into a pot of syrup. When you have enough fruit prepared for your jars, bring to boil and turn off heat. Fill jars with hot fruit and cooking liquid, leaving 1/2-inch head space. Wipe the rims clean, remove any air bubbles and place your lids. Leave 1/2 " head space. Water bath 25 minutes for pints. 30 minutes for quarts, at gentle steady boil.